The Architizer A+ Awards are open for public voting, and it's well worth the time to click through and choose your favorites. There are some really great projects—and a few duds—but certainly a wide range of spaces, materials, and building types for just about anyone, from strangely gorgeous parking garages to Romantic and fantastical towers standing in the middle of lakes. Below are some of my own personal favorites. Note that all photos and verbatim descriptions come via Architizer. For the past two years, this experimental work space served as a venue for a series of design, culture and social practice experiments. Created and directed by an architecture firm's principals and owners, this project brought together a host of community organizations and individuals including artists, activists, performers, a food entrepreneur, academics, high school filmmakers, collectors, an urban design think tank, historians, builders, engineers, museums, poets, advocates for the homeless, curators, educators, and a mushroom farmer. Each partnership began with asking potential collaborators, "What can we do together that we can't do apart?" 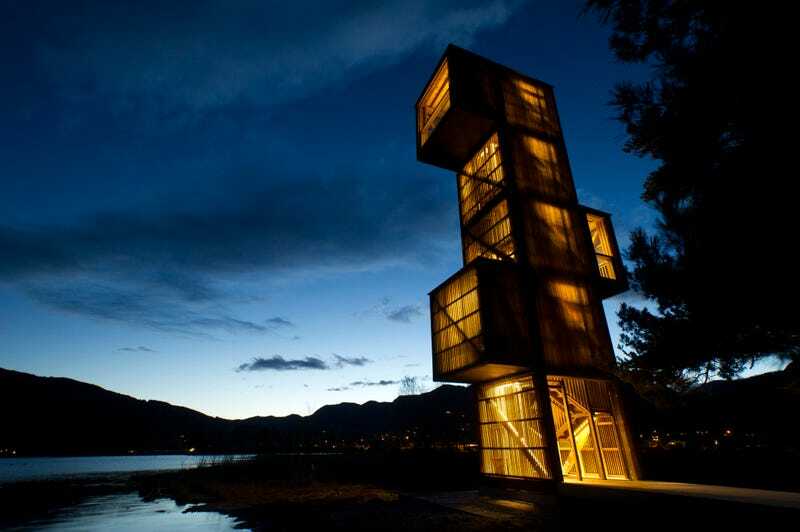 Photo courtesy Olson Kundig Architects / Joe Iano / Nate Watters / Kevin Scott. On the shore of an idyllic white sandy beach on New Zealand's Coromandel Peninsula rests an elegant hut. The site lies within the coastal erosion zone, where all building must be removable. This is taken literally and the hut is designed on two thick wooden sleds for movement back up the site or across the beach and onto a barge. Photos courtesy of Jackie Meiring. The myth about a sea serpent in the lake of Seljord has become an integral part of how the local people of Telemark conceive its majestic landscape. Tales about mysterious phenomena in the lake have flourished for centuries and are a natural part of the daily life in the area. In 2008, the municipality of Seljord decided to use this mythical feature as a point of departure for a development programme for the area. They commissioned Rintala Eggertsson Architects to design different lookout points around the lake to ease the access for local population and visitors to experience the lake at some important places. Photos courtesy of Rintala Eggertsson Architects. The tower is a functional building for international rowing regattas on the Rotsee, near Lucerne, during 3 weeks. The rest of the year the building remains closed and is an enigmatic house-like sculpture on the reflecting water surface. This metamorphosis taking place every year was the ambitious challenge in designing the finish tower. Images courtesy Fuhrimann Hächler Architects. The Tricycle House reduces private living to the smallest footprint and promotes sustainable living by taking advantage of public resources. Public parks replace personal gardens, public toilets replace private toilets, parking spaces replace land-owning, and through the translucent exterior the interior is lit by sunlight during the day and street lighting at night. Photos courtesy of People's Architecture Office. The Tracuit mountain hut (altitude 3256 metres) is situated in the heart of the valaisan Alps. Its position makes it the ideal starting-point for climbing the Bishorn, the Weisshorn, and the Tête de Milon. Photos courtesy Savioz Fabrizzi Architects and Thomas Jantscher. Scenic Lake Tahoe has become a year-round residential community and a popular recreational retreat for the 11.5 million people living within driving distance. As a result, traffic congestion and pollution threaten Tahoe's natural resources and beauty. To encourage greater reliance on public transportation, Placer County commissioned us to design a new transit center. The idea of treading lightly on the land was our mantra. We minimized the facility's footprint by configuring the bus loop with passenger loading on both sides, with a site layout incorporating existing trees and walking and cycling paths. The stone in the walls and columns comes from the Sierras; the timber is also local. To further relate to the natural setting, the roof creates a long, low horizon line among the tall trees. Shaped like a boat, with long wooden slats along the underside, the roof is supported by a few stone columns to allow views of the landscape. Overall, design complements the unique mountain character of Lake Tahoe in a way that is modern and iconic of transportation but also, unquestionably, of its place. Photos courtesy WRNS Studio / Bruce Damonte. ÁBATON has developed the ÁPH80 series as a dwelling ideal for 2 people, easily transported by road and ready to be placed almost anywhere. The proportions are the result of a thorough study by our architects' team so that the different spaces are recognizable and the feeling indoors is one of fullness. It is a simple yet sturdy construction made of materials chosen to provide both comfort and balance. ÁPH80 embodies the principles and objectives of ÁBATON: wellbeing, environmental balance, and simplicity. Photos courtesy of ÁBATON Architects. Located in Manhattan's exclusive NOHO district, 41 Bond Street is an 8-story residential building that occupies a prime spot in the historic neighborhood. Working on an interdisciplinary team led by DDG Partners, Future Green Studio provided landscape design and installation for the building façade, entrance canopy, a rear garden, a patio garden, extensive green roof and several landscaped terraces. Photo courtesy FUTURE GREEN STUDIO. A new topography that integrates pedestrian accessibility, existing palms and permeable surfaces. Photo courtesy Lab for Planning and Architecture (LPA).